So I’ve been reading a lot in the past couple years. And I mean a lot. I’ve probably read more books in the past two years than I’ve read in my life prior to 2009. And that’s like, six books or something. I’ve read quite a lot of classics, and quite a lot of just crap. After finishing a ginormous 3-in-1 Dean Koontz book that took me a month to read, I needed something holistic, real, spiritual and enlightening. I picked up my old copy of Siddhartha, which was required reading in one of my college classes. I’m pretty sure I’d never actually read this book, even when it was required reading. Back in my college days, I don’t think I would’ve retained much of the book anyway because according to statistics, the male brain doesn’t really function during college. During the college years, the male brain has to service two existential paradigms: 1) is it too early for beer and 2) do you think we could jump that in this car? Siddhartha is a young Brahmin, a religious student and scholar. Siddhartha has a best friend, Govinda. Govinda, and pretty much everyone else highly regard Siddhartha as he’s just an all around good dude. But Siddhartha is frustrated. He’s not content with his path in life and his spiritual studies. He’s extremely intelligent and just “gets it”, but he feels strongly that there is something still missing in his life’s path. He tells Govinda that he’s going to become a Samana, which is basically a peasant monk who endures suffering in the forms of fasting and patience. Siddhartha and Govidna are accepted into a Samana tribe, and live the Samana life for 3 years in the forest. Sleep, pray, meditate and fast all while possessing absolutely nothing. Soon there is word that Buddha, the Perfect One will be through, to offer his teachings. Govinda excitedly convinces Siddhartha to go to listen to Buddha speak. After hearing the Illustrious One, Govinda is convinced that they must go and continue their spiritual learnings and servitude under Buddha. Siddhartha isn’t convinced as he doesn’t feel as if there’s much more he can be “taught.” Siddhartha respectfully asks to speak to the Illustrious One, and he is granted the opportunity. The gist of the conversation is that Siddhartha thinks that Buddha is nothing short of the most righteous and awesome dude there is, and is worthy of the masses of followers, however, Siddhartha feels that he must experience life by his own devices, instead of those taught through others. Buddha appreciates the young student’s early enlightenment and unquenchable thirst for knowledge and furthering his real life experiences. Siddhartha gets Buddha’s blessing and well-wishes, with a half-cocked smile. And so Siddhartha heads out on his own – on his quest for real life experiences. Thankfully he has his experience as a Brahmin and Samana on his side, because he goes for many days where he has to fast and just be patient in his travels. He befriends many people on his journey and learns from “ordinary” people. He finds himself most enjoying the most ordinary of things, like the flowing river, trees, fish swimming, birds chirping, and the moon and the stars. Before long, he happens upon a river with a town at the other side. He speaks to the local fisherman, who he quickly befriends and is granted a ride across the river. Siddhartha has nothing to offer the boatman. The boatman kindly acknowledges that Siddhartha’s friendship is payment enough, and notes that Siddhartha will be back at some point and will be able to repay. Siddhartha finds himself witnessing a procession with a woman being carried by her servants. Siddhartha is enamored by the woman, and requests to make her acquaintance by one of her servants. She agrees, and she is somewhat smitten by Siddhartha, due most to his all-around awesomeness. Siddhartha asks Kamala to teach him the ways of her indulgent lifestyle. She laughs at him as he is just a lowly Samana, and that he would need fine clothes, shoes and money to be able to carry with the well-to-do in most villages. He asks how he can attain these things, and she instructs him to meet with a local merchant by the name of Kamaswami, but he is not to portray himself as any less than Kamaswami. Siddhartha agrees to meet with Kamaswami because he wants to get some fancy shoes and money so he can get some of that sweet Kamala lovin’. Siddhartha meets with Kamaswami and they quickly become friends. Kamaswami invites Siddhartha into his home and they discuss business. 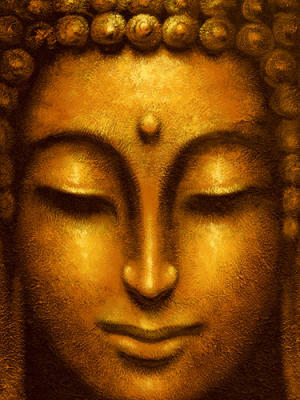 Siddhartha has absolutely nothing to offer, but has the gift of knowing how to fast, to think, and to be patient. He also knows how to read and write. Kamaswami takes on Siddhartha as a business partner and teaches him many things in the ways of being a merchant. Kamaswami is frequently stressed with rising prices, exchanges and late debtors. Siddhartha takes all of these things lightly, and nothing seems to bother him. All of Siddhartha’s business associates like him and enjoy his company. If a business deal goes bad, Siddhartha says, “oh well,” while Kamaswami gets stressed and his health suffers. Siddhartha would travel for business and if no business was had, Siddhartha would report to Kamaswami that he enjoyed himself, met many new friends and experienced many new things. This, also, stressed Kamaswami. Siddhartha soon succumbs to the business life of the merchant. What used to be a frivolous game with no consequences and many friends to gain, soon changes into a life of sleepless nights, stress, and aging body and face and deteriorating mental and physical health. He finds himself lying awake at night, reminiscing on his younger life when he had no possessions and an undying quest for knowledge and experiences. He becomes addicted to playing dice and often bets such large sums of money and his estate, that most can’t play against him. Often times he loses, which only compels him to work harder so he can earn more and play dice again. And that’s pretty much where I am at halfway through the book. I don’t think I could get into this book when I was in college because I wasn’t old enough to have had any real world experiences like real work or endured many sufferings. I was far from mature. I was in a protected bubble monetarily, physically and psychologically. After having been in the “real world” for over a decade now, I find myself wondering, “what am I really doing all of ‘this’ for?” Realistically I know, and am reminded that I have family for which to provide, and an ecosystem in which I’m compelled to be of service. I’m thankful that I’m conscious and have the capacity to see myself from the outside and have those fleeting opportunities to take inventory. I can see myself, my family, friends and strangers alike, all chasing our tails. I wonder if the right way is to keep chasing until it’s caught, or until our emotional and physical well-being is just beaten down and defeated, or to just stop, fast, think, be patient. I think my path is to just keep slowing down and do whatever I can do be a righteous dude, be of service to others and provide an example to my brood. I love having a child – specifically, a 5-year-old daughter. At 5-years-old, she has become a miniature social and psychological embodiment of me, with a significant percentage of Elise mixed in there as well. Seriously, who better to hang out with than an amalgamation of my two favorite people in the world?! She reminds me a lot of me in that she’s somewhat introverted. She’s comfortable with the people she knows, but she takes her time and has her own process to attain that comfort level. This past Friday evening she and I were hanging out in the front yard like we do just about every evening when the weather’s nice. Our neighbors came over to chat for a while in our driveway. After talking for a few minutes, Maly politely interrupted to let us all know that she had a secret that she wanted to share. She then went on for 15 minutes, relaying the synopsis of Dean Koontz’s “Darkfall” novel. You see, one night before bed, Maly had asked me why there were “bad” or “scary” things. I don’t remember the exact context, but I told her that while there are many bad and scary things in the real world, many are created in the imagination and subconscious. I went on to explain to her that she should always embrace and explore her own imagination, and to express it in words, drawings, paintings, music or whatever she sees fit. It was then that I told her about this Dean Koontz book that I was reading. And I didn’t pull any punches. I told her about the slimy, gray-green ratlike demon monsters with rows of razor sharp teeth and fire white eyes who lurked after the protagonist’s children in the night. With each detail I relayed, I told her that it was the author’s imagination that he was sharing in the form of a book. As I told her this story, I gauged her reactions and knew that she was interested above scared. I think she really appreciated and understood the notion of an authoring pouring his thoughts and imagination onto paper. I think she’s been so excited that she hasn’t been able to sleep for a whole week! My neighbors needed their wind chime repaired and I really needed a project to work on (If I’m not creating, building or fixing something these days, I get out of sorts). 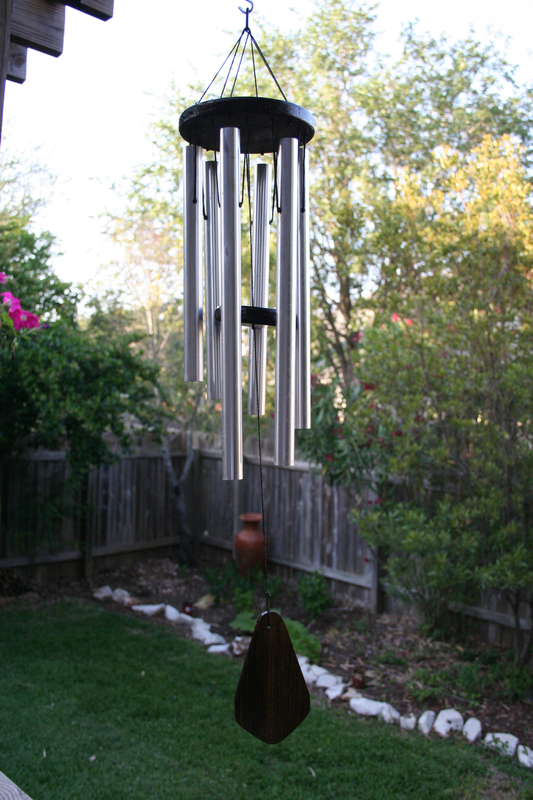 So, I stole my neighbors’ wind chime while they were out of town. It had rotted and was broken into many pieces from being out in the elements for who knows how many years. My main challenge was cutting the perfect circles for the “head” and the “chime tube striker”. I went to the big home improvement stores and couldn’t find 7-inch and 3-inch diameter circles, so I decided to teach myself how to cut perfect circles from wood. After fabricating a jig for my router, I had the perfect circles that I needed. After routing the edges of the circles and some sanding, I think they turned out nice. By employing some Bohemian geometry, I drilled holes for the chord to hang the chimes, the clanger and to suspend the entire wind chime. Then I cut out the wind catcher. I’m rebuilding a wind chime and needed 7-inch and 3-inch diameter wood circles. I went to both Lowes and Home Depot and neither had little wooden circles, nor could they cut them for me. So I picked up a piece of white pine, came home and figured out how to cut out a perfect circle using my router. I had to create my Bohemian circle cutting jig (keep in mind, I’ve only used this router a couple times) using a scrap piece of lumber and mounting it to the router’s guide rods. I was pretty stoked, while wishing I would’ve taken wood shop in high school.